holding spear over shoulder and shield. XXI in Exergue. T in right field. Providentia standing left, holding globe and transverse scepter. 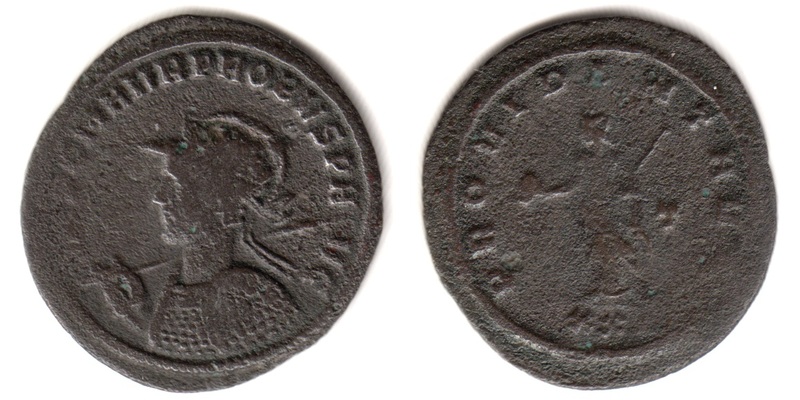 Minted in Siscia (Sisak, Croatia) in 277 A.D.
Webb, P.H., "Roman Imperial Coinage", Volume 5, Part 2 (RIC), p94, nr. 723, obverse bust G, var. with T in reverse left field. Van Meter, D., "Handbook of Roman Imperial Coins", p261, nr 37, var. with Ol/5.